Presented below is CAIDA's 2015 visualization of both IPv4 and IPv6 Internet topology at the Autonomous System (AS) level. Figure 1. IPv4 and IPv6 AS Core January 2015. 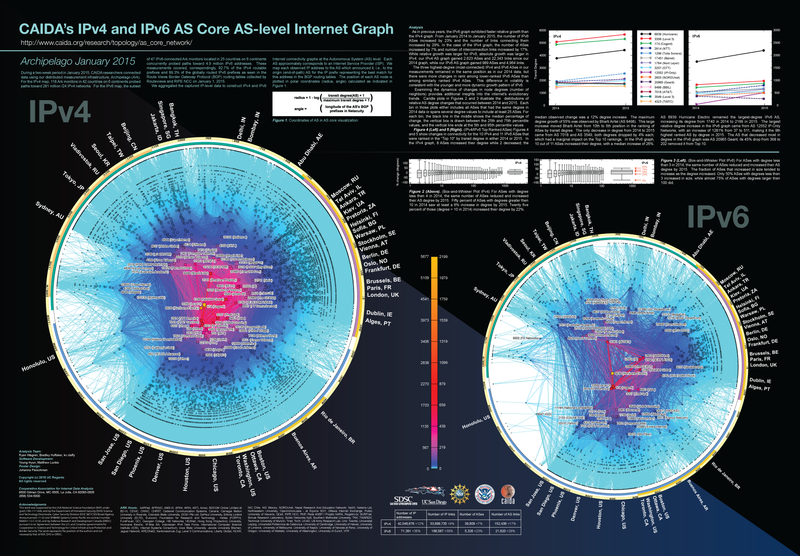 This visualization represents a macroscopic snapshot of IPv4 and IPv6 Internet topology samples captured in 2015. The plot illustrates both the extensive geographical scope as well as rich interconnectivity of nodes participating in the global Internet routing system. During a two-week period in January 2015, CAIDA researchers connected data using our distributed measurement infrastructure, Archipelago (Ark). For the IPv4 map, 118 Ark monitors in 42 countries on 6 continents probed paths toward 281 million /24 IPv4 networks. For the IPv6 map, the subset of 47 IPv6-connected Ark monitors located in 25 countries on 6 continents concurrently probed paths toward 4.9 million IPv6 addresses. These measurements covered, correspondingly, 92.7% of the IPv4 routable prefixes and 89.3% of the globally routed IPv6 prefixes as seen in the Route Views Border Gateway Protocol (BGP) routing tables collected by Routeviews and RIPE NCC on January 1, 2015. Figure 2. Coordinates of AS in AS core visualization. 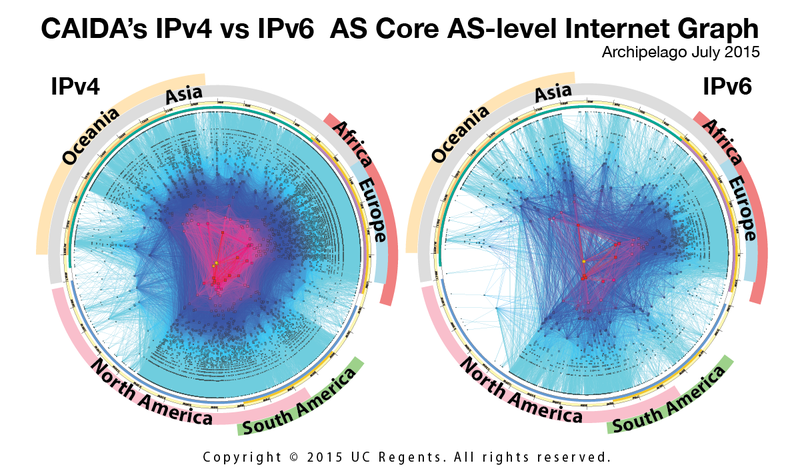 We aggregated the captured IP-level data to construct IPv4 and IPv6 Internet connectivity graphs at the Autonomous System (AS) level. Each AS approximately corresponds to an Internet Service Provider (ISP). We map each observed IP address to the AS which announced it, i.e., to the origin (end-of-path) AS for the IP prefix representing the best match for this address in the BGP routing tables. As in previous years, the IPv6 graph exhibited faster relative growth than the IPv4 graph. During a one year period from January 2014 to January 2015, the number of IPv6 ASes increased by 23% and the number of links between them increased by 29%. In the case of the IPv4 graph, the number of ASes increased by 7% and the associated links increased by 17%. On the other hand, wihle the relative growth was large for IPv6 the actual growth was larger in IPv4. IPv4 graph was 2,623 ASes and 22,343 links larger in 2015, while IPv6 gained 989 ASes and 4,964 links. The three highest-degree (most-connected) IPv4 and IPv6 ASes in our measurements remained in the same position as in our 2014 data, but there were more changes in rank among lower-ranked IPv6 ASes than among similarly ranked IPv4 ASes. This difference in volatility is consistent with the younger and more dynamic growth pattern of IPv6. Examining the dynamics of changes in node degrees (number of neighbors) provides additional insights into the internet's evolutionary trends. Candle plots in Figures 2 and 3 illustrate the distributions of relative AS degree changes that occurred between 2014 and 2015. Each bin in those plots either includes all ASes that had the same degree in 2014 data or spans several degree values to include at least 25 ASes. For each bin, the black line in the middle shows the median percentage of change, the vertical box is drawn between the 25th and 75th percentile values, and the vertical line ends at the 5th and 95th percentile values. Figure 3 shows that for ASes with degree less then 4 in 2014, the same number of ASes reduced and increased their AS degree by 2015. Fifty percent of ASes with degrees greater then 10 in 2014 saw at least a 6% increase in degree by 2015. Twenty five percent of those (degree > 10 in 2014) increased their degree by 22%. In contrast, in Figure 4, shows that for ASes with degree less than 3 in 2014, the same number of ASes reduced and increased their AS degree by 2015. The fraction of ASes that increased in size tended to increase as the degree increased. Only 50% ASes with degrees less then 3 increased in size, while almost 75% of ASes with degrees larger then 100 did. the median lines in all bins are above 0 indicating that between 2013 and 2014 more IPv6 ASes tended to increase than to decrease their degrees in all degree ranges. Moreover, less than 25% of IPv6 ASes that had degrees of 4 or more in 2013, decreased their degrees by 2014. Figures 2 and 3 rm our observation that the IPv6 inter-AS connectivity grew relatively faster than the IPv4 one. 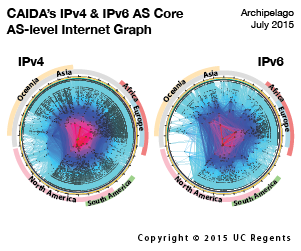 Figure 5 shows the changes in connectivity for the 11 IPv4 and 12 IPv6 ASes that were ranked in the "Top 10" by transit degree in either 2013 or 2014. In the IPv4 graph, 8 ASes increased and 3 decreased their degree, the median of observed changes being 17% degree increase. The maximum growth of 321% was observed for Bharti Airtel (AS 9498) propelling this AS into the Top 10 group. The transit degree of RETN (AS 9002) decreased by 22% removing it from the Top 10 group in 2014. In the IPv6 graph, 10 of the 12 shown IPv6 ASes increased their degree, with a median increase of 70%. Hurricane Electric (AS 6939) remained the largest IPv6 AS, increasing its degree from 966 in 2013 to 1740 in 2014. GEANT (AS 20965) and Biznet (AS 17451) showed the largest relative degree increase in the IPv6 space, acquiring nearly 425% and 244% new IPv6 neighbors correspondingly, and thus entering into the "Top 10" group. At the same time, Cable & Wireless (AS 1273) and Global Crossing (AS 3549) saw their IPv6 degree decreasing by 49% and by 13% therefore losing their Top 10 positions. This AS core visualization addresses one of CAIDA's topology mapping project goals is to develop techniques to illustrate structural relationships and depict critical components of the Internet infrastructure. These IPv4 and IPv6 graphs show the relative growth of the two Internet topologies, and in particular the steady continued growth of the IPv6 topology. Although both IPv4 and IPv6 topologies experienced a lot of churn, the net change in number of ASes was +2,612 (+7%) in our IPv4 graph and +989 (+23%) in our IPv6 graph.